The Beatles. *NSYNC. Backstreet Boys. One Direction. Boy bands have captured the hearts of millions of girls and women for decades. We can’t help but love (and obsess over) them. 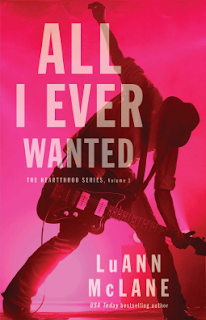 Perfect for anyone who’s ever loved a boy band, ALL I EVER WANTED (Pocket Star eBooks, On-sale: July 24, 2017; ebook; $1.99) by bestselling author LuAnn McLane brings you another boy band (even if they’re fictional) to fall in love with. Heartbeat was the cult-phenomenon lead by oldest brother Grady Heart. When Grady decides to reunite the band for a highly-anticipated reunion tour, he wasn’t expecting to also reunite with his ex-girlfriend, who also happened to be Heartbeat’s old choreographer. In Heartbeat’s glory days, Grady had fallen hard for Arabella, but her lack of trust in him eventually drove them apart. Reunited once again, their chemistry burns hotter than ever, but Grady tries to keep his relationship with Arabella strictly professional this time. However, his heart might just still long to find out what could have been.